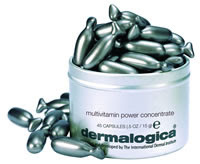 Dermalogica Multivitamin Power Concentrate is a unique skin treatment that delivers a concentrated dose of pure vitamins to help reduce the signs of premature aging. Vitamin A increases elasticity and moisture content, firming and strengthening the skin. Antioxident Vitamin C stimulates natural collagen synthesis to restore suppleness, while Vitamin E promotes healthy tissue regeneration as it slows further cellular damage. Dermalogica Multivitamin Power Concentrate is suitable for drier or prematurely-aging skin and is part of the Dermalogica AGE Smart range.